Lisfranc Injury: The foot has two major joints that allow you to walk across uneven surfaces. One of these joints runs crossways across the mid section of the foot. It is shown in the diagram opposite. It is where the small block-like bones from the back of the foot join onto the base of the long thin bones that run down to the ground in the ball of the foot. These days, this is mostly referred to as the midtarsal joint. What sort of accident might cause a Lisfranc Injury to the foot? The term Lisfranc came from a French army surgeon in the 1800’s. He was the first to observe and describe a common injury that occurred when men fell off their horses and were dragged along with their foot caught in the stirrup. This will give you some idea of the mechanics of the injury. Essentially, the front part of the foot is forced down. This results in a separation of the tissues on the top of the mid-foot area. Common ways to do this include the front of the foot buckling under as your whole body weight comes down on it. Running into a hole, getting tackled, falling down an unexpected stair and missing your footing as you change direction are good examples. It can also occur by a direct impact to the foot. There are 3 main types of Lisfranc injuries: a sprain, a dislocation or a fracture. Sprain: An injury to the soft tissue / tendons / ligaments / muscles in the area. This mostly happens to the tissue over the top of the joint. 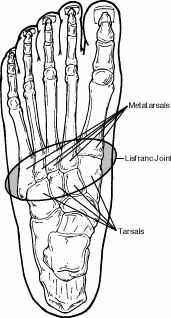 Disclocation: Occurs when one of the bones in the Lisfranc joint complex is pushed out of its normal position. Fracture: Occurs if one of the bones has an incomplete or a complete break through it, or if the soft tissue has been pulled away from the bone, taking a chunk of bone with it. Bruising around the middle of the foot, although the blood may ‘sink’ down in the tissues and appear along the sole of the foot too. The midfoot area is swollen and painful. The pain might run from side to side, or longways down the instep, or a combination of both. Treatment varies depending on the severity of the injury. Mild to moderate injuries may respond to conservative treatment. This might include wearing a cast or a pre-fabricated “moon boot” for approximately 6 weeks. Additionally an anti-inflammatory, such as ibuprofen, may be recommended to assist in relieving the pain associated with inflammation. For more significant pain, stronger pain management medication may be required. If the Lisfranc injury is severe, surgery may be required. This may include internal fixation. This is essentially a pin to allow the bones to stay close together while healing occurs. If you think you might have a Lisfranc injury to the mid foot, make an appointment with one of our experienced podiatrists to be examined as soon as possible.